Have you heard the news? 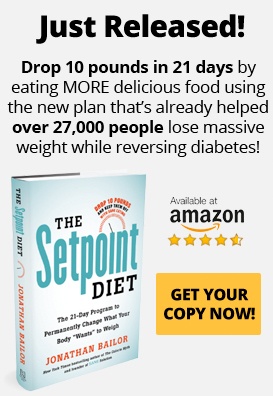 Jonathan Bailor’s newest bestseller, The Setpoint Diet book, contains a scientifically proven plan that helps you lose 10 pounds or more in just 21 days. And unlike all the other diets you may have tried, this weight loss will be permanent. That’s right. No more calories counting or starvation. No more yo-yo dieting. Just effortless weight loss without hunger or willpower. How awesome is that? But how can The Setpoint Diet book make such claims? Easy. The information you’ll learn in The Setpoint Diet book is based on hundreds of clinical, peer-reviewed research studies about how the metabolism really works. There is no guesswork involved in these claims, just pure science. The Setpoint Diet book is the culmination of over 15 years of research. Instead of giving you the same fantasy that most traditional, starvation-type diets feed you — ie, eating less and exercising more is all you need to do to lose weight and/or maintain your weight loss — it tells you the truth about calories and your metabolism. This means whether you obtain your 1,500 calories primarily from non-starchy veggies and protein or from chips, soda, and fast foods, you will lose the same amount of weight. Millions of people have been following this advice for decades. You have probably also practiced some version of this eating plan, recording the calories of every food you consumed for the day. When you reached a certain predetermined limit, you stopped eating. A calorie is simply a unit of energy. Every cell in your body requires energy (calories) to function properly. You obtain calories by consuming macronutrients, chemical substances your body needs in large quantities. The three broad classes of macronutrients are proteins, carbohydrates, and fats. Each of these macronutrients has a different effect on the body when consumed. Proteins: Takes more calories to digest than the other macronutrients. They have little effect on blood glucose levels and provide steady energy. Proteins are also almost impossible for the body to store as fat. Carbohydrates: Quickly converted to blood glucose and absorbed into the bloodstream, which provides the body with quick energy. Carbohydrates, especially refined carbs, are easily converted to body fat. Fat: Fills you up fast and keeps you full for a long time. They provide steady energy. With such different effects on the body, macronutrients cannot be distilled down to a simple number of calories. It is much more complex than that. The over-emphasis that traditional dieting places on calories are the exact reason you have had such trouble losing weight — and keeping it off! But the traditional dieting industry keeps believing in the “calorie is a calorie is a calorie” myth because it is an integral part of the calorie-deficit theory of weight loss. If you’ve tried any traditional diet, you’re likely familiar with the calorie-deficit theory of weight loss. This theory states that the only way to lose weight is to starve your body. This will force your body to finally let go of those extra pounds, this theory states. Just like the “calorie is a calorie is a calorie” myth, however, there is a problem with the calorie-deficit theory of weight loss. It is NOT true. Oh, you will lose weight on a starvation diet. But it will be unpleasant…and you won’t lose nearly as much weight as the calorie “math” predicts you’ll lose. How many times have you proven this through your own dieting experience? How many times did you start a new diet with high hopes, excitement, and dedication, only to be disappointed? If you’re like most dieters, you lost 10-15 pounds in the first few weeks. After that, the weight loss slowed down to almost nothing. Throughout the diet, you were often weak, grouchy, and hungry. When you grew tired of feeling so awful, when your frustration at losing barely any weight reached its peak, you went off the diet. That’s right. In no time at all, you started gaining the weight back. Within a few weeks, you gained all of it back plus a few more pounds. You were left ashamed and depressed. You blamed yourself for this dieting failure, probably wondered what you had done wrong. You did nothing wrong. You were simply given incorrect information. What happened to you happens to everyone who attempts to starve their way to weight loss success. Your body fights you every step of the way as it tries to keep you near your setpoint weight. Your setpoint weight is that level of stored fat your body tries to keep regardless of how many calories you consume or exercise off. You see, your body always strives for homeostasis (equilibrium) in its internal system. To that end, it automatically regulates your weight, your body temperature, your blood sugar levels, your respiration, and your other internal systems. How does your body regulate your weight? Well, your brain, digestive system, and hormones talk to one another through various feedback loops to synchronize the activities that automatically maintain body fat at a specific level, which is your setpoint weight. It might help to think of the biological feedback system that establishes your setpoint like the thermostat in your house. Thanks to the thermostat, your heating or air-conditioning system respond to the weather outside and keep your home at whatever temperature the thermostat “thinks” it should be at. Similarly, your setpoint stimulates or suppresses your appetite and raises or lowers metabolism in response to how much fat it “thinks” you should store. So, when you start to cut calories, your body reacts immediately. Its metabolic alarm goes off, signaling your body that you are not consuming as much as you normally do. In response, your body demands more food and starts burning fewer calories. Appetite goes up, calorie burn goes down. The only way to lose weight permanently, as you’ll learn in The Setpoint Diet book, is to lower your setpoint weight. Once you do that, your body will work to maintain body fat at a lower level. You will automatically and effortlessly lose weight. You’ll actually burn fat like a naturally thin person — perhaps for the first time in your life. Research shows that overconsumption of refined carbs, highly processed foods, and sugar can lead to brain inflammation and hormonal dysregulation. It can also disturb the balance of good and bad gut bacteria. All of these raise setpoint weight. Chronic stress has also been found to elevate setpoint weight. This is because stress triggers a release of the stress hormone cortisol which in turn triggers a release of the fat-storage hormone insulin. Research shows sleep deprivation leads to weight gain, especially in the tummy region. Cortisol also seems to be the culprit here, as sleep deprivation triggers a release of cortisol. But studies also show that several hormones that affect weight become dysregulated by lack of sleep, a situation that undoubtedly causes an elevated setpoint weight. Setpoint-elevating toxins are everywhere. Car exhaust fumes. Cleaning detergents. Air fresheners. Dryer sheets. All of them affect setpoint weight. SSRIs (Selective Serotonin Reuptake Inhibitors) are a class of drugs typically used to treat depression and anxiety disorders. They have been shown to significantly elevate setpoint weight when taken regularly. Even intense, extended exercise — such as aerobic exercise and running/jogging — can elevate setpoint weight. This is because intense, extended exercise triggers a release of cortisol. If you perform this type of exercise every day (or frequently) it can lead to elevated blood cortisol levels, a factor known to elevate setpoint weight. The Setpoint Diet book includes a complete diet plan and lifestyle upgrades that will help you lower your setpoint weight — and have fun doing it! The eating plan is amazingly simple and easy to remember. There are no complicated foods or menus to remember, and absolutely NO calories or points to count! Here are a few of the basic dietary principles contained in The Setpoint Diet book. Eat fewer heavily processed foods, fast foods, starchy carbs, and foods with added sugar. Focus on the quality of calories. Once you get the quality right, the quantity will take care of itself. Focusing on the quality of calories means you’ll be so full of SANE foods, you’ll be too full to eat inSANE ones. Always remember: Progress, Not Perfection is one of the most important SANE concepts. Those little successes build up into BIG accomplishments! 10+ servings per day. Fill half your plate with non-starchy vegetables at each main meal. 3-5 servings per day. 30-55 grams per meal. The Setpoint Diet book contains all the information you need to lose weight and keep it off. It helps you lower your setpoint weight, promoting steady and permanent weight loss. But if you’re a bit impatient — and you want to prove the validity of all the information contained in The Setpoint Diet book — you’ll LOVE the 21-Day Challenge. The 21-Day Challenge gives you the most powerful combination of SANE nutrition, activity, nutraceuticals, lifestyle habits, and psychology ever created. It is the only part of The Setpoint Diet book that prescribes a week-by-week plan for you to follow. And there is a reason for that. By following all the recommendations of the week-by-week 21-Day Challenge, you will be using all the tools proven to lower your setpoint weight as quickly, safely, and effectively as possible. You will emerge from the 21-Day Challenge transformed, ready to be SANE for Life. How awesome is that? Is it difficult? Not really. The most difficult part of the 21-Day Challenge is changing your eating and lifestyle habits. Any habit you try to change seems strange or difficult at first. Later, after the transformation is complete, you will realize how very easy making those changes on the 21-Day Challenge really were. Are you ready to get started? Good. Click here to purchase The Setpoint Diet book. You’ll be glad you did!